Last chance: We only have 8 left - This product will not be available again once our stock runs out. Buy 1 for $10.97Buy 2 / Save $0.59!Buy 3 / Save $2.19! Size (inches): 1.77" X 6.50" X 7.68"
The Cube Activity Puzzle is an excellent value item; it allows children to create six different scenes, including two they can color! Free crayons are included inside. These products have been designed with careful attention to detail, and they're durable and safe for your child. 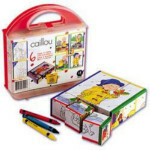 CAILLOU puzzles teach kids new ways of problem-solving. CAILLOU's world is incorporated into a variety of different puzzles, suitable for varying ages and degrees of skill.